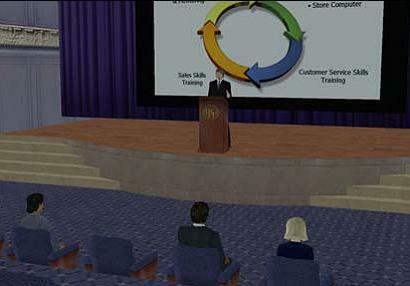 Forterra Systems, a major player in private virtual worlds, announced today the launch of the Company’s Developer Programs designed to make it easy for consultants, system integrators, value-added resellers, Independent Software Vendors, technology partners, education institutions, and business organizations to create, integrate, and deploy 3D applications using Forterra’s OLIVE™ (On-Line Interactive Virtual Environment) software platform. In addition Forterra has altered its price model to be less expensive for a production deployment with small numbers of users. “The 3D Internet is a disruptive force of change that is transforming how businesses, the public sector, and educational institutions train, research, practice, and collaborate,” said Dave Rolston, Forterra’s CEO. “Our Developer Programs and new pricing allow our customers and partners to participate in this powerful market trend more easily through the creation, delivery, and marketing of 3D content, value-add plug-ins, and complete applications based on the OLIVE platform. The Forterra Developer Programs are structured to deliver higher levels of support services and benefits based on varying levels of investment and relationship with Forterra. Tools and resources available through the Developer Programs include: education, developer services, technical support, hosting, account management, and marketing. Forterra has invested heavily in support, training, and documentation services to provide the assistance needed for its customers and partners to achieve success by tapping the power of the 3D Internet. Forterra offers three different Developer Programs to provide the means to get trained, develop, test, demo, prototype and pilot a 3D application with stake-holders before a production deployment. All three of Forterra’s Developer Programs (Basic, Standard, and Premium) include a non-production Developer license of OLIVE that works over a LAN, WAN, and the Internet. A variety of 3D content from existing content packs are included. There is an option for Forterra to host the development server. • Basic is the entry level developer program targeting corporations pursuing a proof of concept, startups with minimal budget, higher education research groups, or small developers and VARs. This affordable program is designed to provide the basic support assistance to help an organization reach its design goals within six months before pursuing a production license of OLIVE. • Standard is Forterra’s main developer program for corporations, value-added resellers, system integrators, and education organizations. This program provides core training, success guidance, and developer services to help an organization reach its design goals within six months before pursuing a production license of OLIVE. • Premium is the top-of-the-line developer program targeting global system integrators creating 3D OLIVE applications as an on-going business practice. This program provides the highest level of developer assistance throughout the year. Account management services are bundled with this program to ensure Forterra is aligned with and proactively assisting integrators to execute business goals as a trusted business partner.